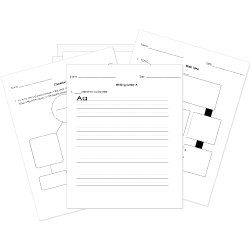 You can create printable tests and worksheets from these English Language Arts questions! Select one or more questions using the checkboxes above each question. Then click the add selected questions to a test button before moving to another page. In the quote above, which words represent a noun phrase? Fill in the blanks in the passage below with the correct punctuation. ILLOGICAL means lacking in a correct relation of reason. What is the adverbial phrase in the sentence below? The baby elephant was curious about the large ball. 1. Always use Pillsbury's Best Flour. 2. Sift flour twice before adding to cakes or breakfast cakes. 3. Make all measurements level by using edge of knife to lightly scrape off from top of cup or spoon until material is even with the edges. 4. Use same sized cups or spoons in measuring for the same recipe. 5. Before starting to make recipe, read through carefully, then put on table all the materials and tools needed in making that particular recipe. to make sure all measurements are the same size. to get rid of any excess ingredients. to scrape spilled ingredients off the counter. to fill the measuring cups to the edge. SURGE means a sudden desire or change of mind. MARTIAL means to cause to move forward with force. SURGE means a sudden, strong increase or burst. Fill in the blanks of the following quote to make sure it contains parallel structure. A tree has the stem of all the plants. Use your knowledge of the rules of grammar to fill in the blank in the quote below. Use the words in parentheses to guide you. "The Mole had been working (to work) very hard all the morning, spring-cleaning his little home." Which words are homophones? Select ALL that are homophones (more than one answer). The Swan is a very beautiful bird. It is generally white, though a black swan has been discovered in Australia. It is not very often seen in this country. It was brought from Asia and Eastern Europe into England, from whence, most probably, a few specimens have been introduced into this country. The Swan is very graceful in the water, but on land it is an awkward waddler. A swan lover wants to put this passage online and add graphics and other features. Which is NOT something he should include on the website? The red ball is than the green ball. VAST means suggesting war or military life. WRITHE means moving in a twisting or contorted motion.